Rationale There is no consensus as to when treatment for idiopathic pulmonary fibrosis (IPF) should be initiated. Some physicians prefer not to treat patients with preserved lung volume. Objective To investigate whether patients with IPF and preserved lung volume receive the same benefit from nintedanib as patients with more impaired lung volume. Methods Post hoc subgroup analyses of pooled data from the two replicate phase III INPULSIS trials by baseline FVC % predicted (≤90%, >90%). Results At baseline, 274 patients had FVC >90% predicted and 787 patients had FVC ≤90% predicted. In patients treated with placebo, the adjusted annual rate of decline in FVC was consistent between patients with FVC >90% predicted and FVC ≤90% predicted (−224.6 mL/year and −223.6 mL/year, respectively). There was no statistically significant difference between these subgroups in the effect of nintedanib on annual rate of decline in FVC, change from baseline in St George's Respiratory Questionnaire total score or time to first acute exacerbation. In patients with baseline FVC >90% predicted and ≤90% predicted, respectively, the adjusted annual rate of decline in FVC with nintedanib was −91.5 mL/year (difference vs placebo: 133.1 mL/year (95% CI 68.0 to 198.2)) and −121.5 mL/year (difference vs placebo: 102.1 mL/year (95% CI 61.9 to 142.3)). Adverse events associated with nintedanib were similar in both subgroups. Conclusions Patients with IPF and preserved lung volume (FVC >90% predicted) have the same rate of FVC decline and receive the same benefit from nintedanib as patients with more impaired lung volume. Trial registration number NCT01335464 and NCT01335477. Do patients with idiopathic pulmonary fibrosis (IPF) and preserved lung volume receive the same benefit from nintedanib as patients with more impaired lung volume? Patients with IPF and FVC >90% predicted at baseline have the same rate of FVC decline and receive the same benefit from nintedanib as patients with more impaired lung volume. These data provide, for the first time, evidence in a significant subgroup of patients with preserved lung volume to support the concept of offering early treatment to patients with IPF. IPF is commonly described using the terms ‘mild’, ‘moderate’ and ‘severe’, or ‘early’ and ‘advanced’.15 However, there is no standard definition for what constitutes ‘mild disease’ or ‘marginally impaired lung function’ in patients with IPF and no consensus regarding at which point therapy should be initiated or stopped, particularly as no treatment has been shown to provide significant symptomatic benefit. Some national guidelines use thresholds of FVC as a percentage of the predicted value (FVC % predicted) to determine when pharmacological treatment for IPF should be used16 but these are not based on scientific evidence. The design of the INPULSIS trials has been described.12 The clinical trial protocol was approved by an Independent Ethics Committee and/or Institutional Review Board at all the participating centres. All patients provided written informed consent prior to study entry. Eligible patients had been diagnosed with IPF within the previous 5 years and had an FVC ≥50% predicted (no upper threshold), a diffusion capacity of the lung for carbon monoxide (TLCO) 30% to 79% predicted and a FEV1/FVC ratio ≥0.7. Patients were randomised to receive nintedanib 150 mg twice daily or placebo in a 3:2 ratio. Post hoc analyses in subgroups of patients with baseline FVC >90% versus ≤90% predicted were conducted using pooled data from the two INPULSIS trials. Analyses were conducted in patients who received ≥1 dose of study drug. Analyses were conducted on the primary endpoint (annual rate of decline in FVC) and the key secondary endpoints (time to first investigator-reported acute exacerbation and change from baseline in SGRQ total score) by repeating the primary analysis for each endpoint (described in ref. 12) in each subgroup. The statistical model used for the primary analysis assumed that missing data were missing at random; missing data were not imputed. For the primary endpoint, the terms subgroup and an interaction term treatment-by-time-by-subgroup were included in the model. For the key secondary endpoints, the terms subgroup and an interaction term treatment-by-subgroup were included in the model. Time to disease progression over 52 weeks, defined as an absolute decline in FVC ≥10% predicted or death, or an absolute decline in FVC ≥5% predicted or death, was assessed using a Cox's regression model with the terms subgroup and an interaction term treatment-by-subgroup included. Safety was assessed through clinical and laboratory evaluation and recording adverse events with onset after the first dose and up to 28 days after the last dose of study drug. Adverse events were coded using the Medical Dictionary for Regulatory Activities (MedDRA), V.16.1. Safety analyses were descriptive. A total of 274 (25.8%) patients had baseline FVC >90% predicted (166 treated with nintedanib, 108 treated with placebo) and 787 (74.2%) patients had baseline FVC ≤90% predicted (472 treated with nintedanib, 315 treated with placebo). Baseline characteristics of patients in each subgroup are presented in table 1. Compared with patients with FVC ≤90% predicted, patients with FVC >90% predicted had a shorter time since diagnosis, higher TLCO % predicted and lower SGRQ total score (indicating better health-related quality of life), and were more likely to have centrilobular emphysema (based on high-resolution CT scan) and to be female. Within each subgroup, baseline characteristics were similar between the nintedanib and placebo groups. In the subgroup of patients with baseline FVC >90% predicted, 43 patients (25.9%) in the nintedanib group and 11 patients (10.2%) in the placebo group prematurely discontinued trial medication. 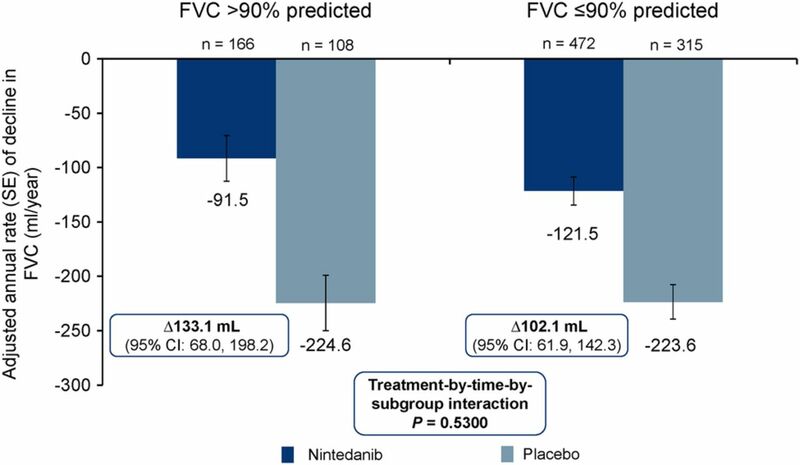 In the subgroup of patients with baseline FVC ≤90% predicted, 113 patients (23.9%) in the nintedanib group and 69 patients (21.9%) in the placebo group prematurely discontinued trial medication. In patients with baseline FVC >90% predicted, mean (SD) duration of exposure was 10.1 (3.6) months and 11.3 (2.0) months in the nintedanib and placebo groups, respectively. In patients with baseline FVC ≤90% predicted, mean (SD) duration of exposure was 10.4 (3.3) months and 10.7 (3.0) months in the nintedanib and placebo groups, respectively. In patients with baseline FVC >90% predicted, the adjusted annual rate of decline in FVC was −91.5 mL/year in the nintedanib group and −224.6 mL/year in the placebo group (difference of 133.1 mL/year (95% CI 68.0 to 198.2)) (figure 1). In patients with baseline FVC ≤90% predicted, the adjusted annual rate of decline in FVC was −121.5 mL/year in the nintedanib group and −223.6 mL/year in the placebo group (difference of 102.1 mL/year (95% CI 61.9 to 142.3)) (figure 1). The treatment-by-subgroup interaction p value was not significant (p=0.530), indicating that the treatment effect of nintedanib was not different between the subgroups. The primary endpoint results were supported by the observed changes from baseline in FVC over time in each subgroup (see online supplementary figure S1). Adjusted annual rate (SE) of decline in FVC (mL/year) by subgroup. In patients with baseline FVC >90% predicted, the HR for time to an absolute decline in FVC ≥10% predicted or death was 0.59 (95% CI 0.38 to 0.89) in favour of nintedanib (table 2; figure 2). In patients with baseline FVC ≤90% predicted, the corresponding HR was 0.61 (95% CI 0.48 to 0.78) in favour of nintedanib (table 2; figure 2). The treatment-by-subgroup interaction p value was not significant (p=0.830), indicating that the treatment effect of nintedanib was not different between the subgroups by baseline FVC. 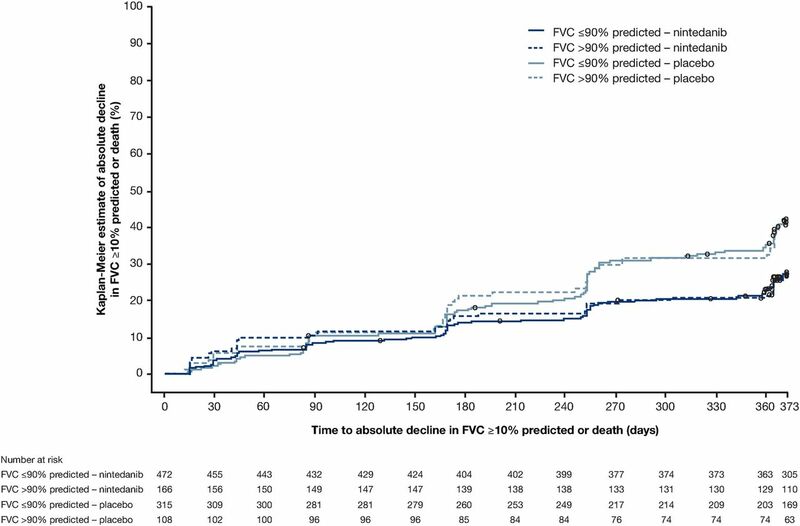 In both subgroups, most patients who met this endpoint did so based on absolute decline in FVC ≥10% predicted rather than death, but the proportion of patients who died over 52 weeks was higher in patients with FVC ≤90% predicted than >90% predicted at baseline (table 2). 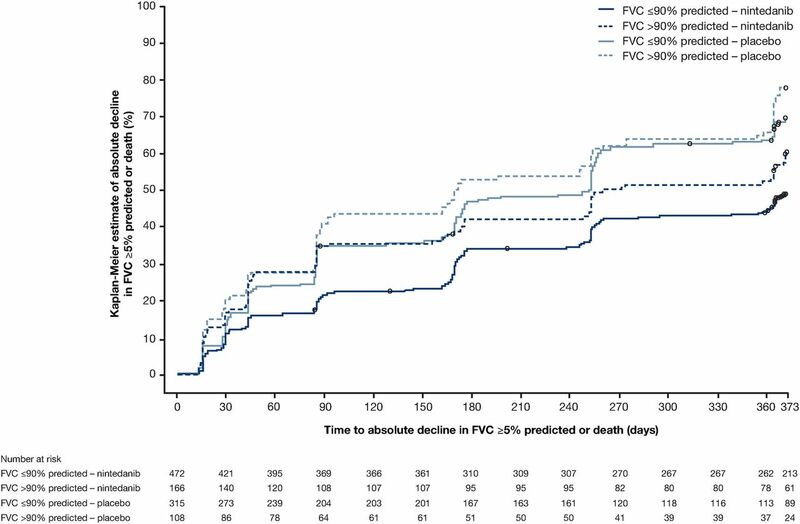 Time to absolute decline in FVC ≥10% predicted or death over 52 weeks by subgroup. HR was 0.59 (95% CI 0.38 to 0.89) in patients with baseline FVC >90% predicted and 0.61 (95% CI 0.48 to 0.78) in patients with baseline FVC ≤90% predicted. Treatment-by-subgroup interaction p=0.830. In patients with baseline FVC >90% predicted, the HR for time to an absolute decline in FVC ≥5% predicted or death over 52 weeks was 0.67 (95% CI 0.50 to 0.90) in favour of nintedanib; the proportion of patients who met this endpoint was 60.2% in the nintedanib group and 77.8% in the placebo group. In patients with baseline FVC ≤90% predicted, the corresponding HR was 0.59 (95% CI 0.49 to 0.71) in favour of nintedanib (figure 3); the proportion of patients who met this endpoint was 48.7% in the nintedanib group and 69.5% in the placebo group. The treatment-by-subgroup interaction p value was not significant (p=0.486), indicating that the treatment effect of nintedanib was not different between the subgroups by baseline FVC. Time to absolute decline in FVC ≥5% predicted or death over 52 weeks by subgroup. HR was 0.67 (95% CI 0.50 to 0.90) in patients with baseline FVC >90% predicted and 0.59 (95% CI 0.49 to 0.71) in patients with baseline FVC ≤90% predicted. Treatment-by-subgroup interaction p=0.486. In patients with baseline FVC >90% predicted, the HR for time to first acute exacerbation was 0.46 (95% CI 0.09 to 2.48) in favour of nintedanib (figure 4); the proportion of patients with ≥1 acute exacerbation was 1.8% in the nintedanib group and 2.8% in the placebo group (three patients in each group). In patients with baseline FVC ≤90% predicted, the HR for time to first acute exacerbation was 0.66 (95% CI 0.39 to 1.11) in favour of nintedanib (figure 4); the proportion of patients with ≥1 acute exacerbation was 5.9% in the nintedanib group and 9.2% in the placebo group (28 and 29 patients, respectively). The treatment-by-subgroup interaction p value was not significant (p=0.956), indicating that the treatment effect of nintedanib was not different between the subgroups. Time to first acute exacerbation over 52 weeks by subgroup. HR was 0.46 (95% CI 0.09 to 2.48) in patients with baseline FVC >90% predicted and 0.66 (95% CI 0.39 to 1.11) in patients with baseline FVC ≤90% predicted. Treatment-by-subgroup interaction p=0.956. In patients with baseline FVC >90% predicted, the adjusted mean change from baseline in SGRQ total score at week 52 was 2.16 in the nintedanib group and 3.02 in the placebo group (difference of −0.87 (95% CI −3.97 to 2.24)) (see online supplementary figure S2). In patients with baseline FVC ≤90% predicted, the adjusted mean change from baseline in SGRQ total score at week 52 was 4.00 in the nintedanib group and 5.64 in the placebo group (difference of −1.65 (95% CI −3.60 to 0.31)) (see online supplementary figure S2). The treatment-by-subgroup interaction p value was not significant (p=0.3382), indicating that the treatment effect of nintedanib was not different between the subgroups. A summary of adverse events is shown in online supplementary table S1. The proportions of patients who had ≥1 adverse event or ≥1 serious adverse event were comparable between the nintedanib and placebo groups within each subgroup. 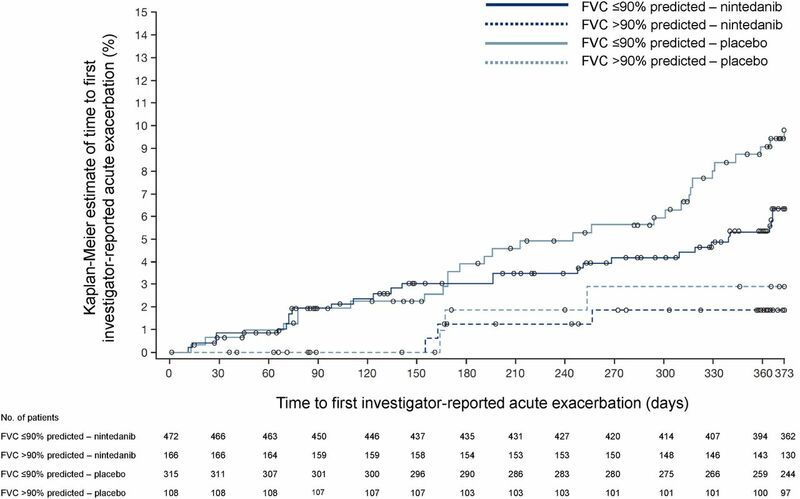 A higher proportion of patients had ≥1 serious adverse event in the subgroup of patients with baseline FVC ≤90% predicted than FVC >90% predicted. Adverse events led to premature discontinuation of study drug in 21.7% of nintedanib-treated patients with baseline FVC >90% predicted and 18.4% of patients with baseline FVC ≤90% predicted, compared with 7.4% and 14.6% of placebo-treated patients in these subgroups, respectively. Diarrhoea was the most frequent adverse event in patients treated with nintedanib, reported in 62.0% of patients with baseline FVC >90% predicted and 62.5% of patients with baseline FVC ≤90% predicted, compared with 15.7% and 19.4% of placebo-treated patients in these subgroups, respectively. Diarrhoea led to premature discontinuation of study drug in 4.2% of nintedanib-treated patients with baseline FVC >90% predicted and 4.4% of patients with baseline FVC ≤90% predicted, compared with no and 0.3% of placebo-treated patients in these subgroups, respectively. Our data from the INPULSIS trials have shown for the first time that placebo-treated patients with a baseline FVC >90% predicted have the same rate of FVC decline over the following year as patients with greater impairment in lung volume and the same likelihood of disease progression defined as an absolute decline in FVC % predicted ≥10% or death. It is notable that over 40% of placebo-treated patients with an FVC >90% predicted at baseline, a subgroup that represented over 25% of patients recruited into the INPULSIS trials, reached this disease progression endpoint after 1 year. Furthermore, over 75% of placebo-treated patients with an FVC >90% predicted at baseline had an absolute decline in FVC % predicted of ≥5% after 1 year, suggesting that fewer than one in four patients with preserved lung volume at baseline had stable FVC over the following year. Treatment with nintedanib slowed the annual rate of decline in FVC in patients with FVC >90% and ≤90% predicted to the same extent. These are the first data to show the efficacy of an antifibrotic drug in patients with FVC >90% predicted. Low or worsening FVC has been shown to be a risk factor for acute exacerbations.19–21 In this analysis, the proportion of patients who had ≥1 acute exacerbation over 52 weeks was higher in placebo-treated patients with FVC ≤90% than >90% predicted (9.2% vs 2.8%). Nintedanib appeared to have the same treatment effect on acute exacerbations in both subgroups, but the interpretation of these data is limited by the low number of acute exacerbations in the subgroup with FVC >90% predicted (six events in 274 patients). No difference was observed between subgroups in the effect of nintedanib in change in SGRQ total score, which was small in both subgroups, consistent with the overall patient population. In conclusion, in this analysis of pooled data from the INPULSIS trials, the annual rate of decline in FVC was similar in placebo-treated patients with preserved lung volume (FVC >90% predicted) at baseline as in patients with greater impairment in lung volume. Nintedanib slowed the decline in lung function independent of the degree of FVC impairment at baseline, with a similar adverse event profile in both subgroups. These findings support the concept of offering treatment to patients with IPF and preserved lung volumes at the time of diagnosis, until there are markers that predict individual disease course. Medical writing assistance, supported financially by Boehringer Ingelheim, was provided by Julie Fleming and Wendy Morris of Fleishman-Hillard Group, London, UK, during the preparation of this article. The authors were fully responsible for all content and editorial decisions, and were involved at all stages of manuscript development and have approved the final version.
. An official ATS/ERS/JRS/ALAT clinical practice guideline: treatment of idiopathic pulmonary fibrosis. An update of the 2011 clinical practice guideline. Am J Respir Crit Care Med 2015;195:e3–19. National Institute for Health and Care Excellent (NICE).Pirfenidone for treating idiopathic pulmonary fibrosis. NICE technology appraisal guidance 282. Issued April 2013. http://guidance.nice.org.uk/ta282 (accessed 25 Feb 2016).
. Effect of baseline FVC on decline in lung function with nintedanib in patients with IPF: results from the INPULSIS® trials [abstract]. Am J Respir Crit Care Med 2015;191:A1021.
. Risk factors of acute exacerbation of idiopathic pulmonary fibrosis. Sarcoidosis Vasc Diffuse Lung Dis 2010;27:103–10.
. Long-term treatment with nintedanib in patients with IPF: an update from INPULSIS-ON. Eur Respir J 2016;48(Suppl 60):OA4960. Contributors All the authors except WT were involved in the study design. All the authors were involved in analysis or interpretation of data and revising the manuscript for important intellectual content. All the authors have approved the final version of the manuscript. Funding The INPULSIS trials were funded by Boehringer Ingelheim. Boehringer Ingelheim was involved in the study design, in the analysis and interpretation of the data and in the writing of this manuscript. Competing interests MK reports receipt of grants and personal fees from Boehringer Ingelheim and Roche; personal fees from GlaxoSmithKline, Gilead, AstraZeneca, ProMetic and Genoa; and grants from Actelion, Respivert, the Canadian Institute for Health Research and the Canadian Pulmonary Fibrosis Foundation. LR reports receipt of grants and personal fees from Boehringer Ingelheim for being a member of the INPULSIS steering committee and co-principal investigator of the trials; grants and personal fees from InterMune for being a member of an advisory board; personal fees from MedImmune (advisory board member), Biogen Idec (consulting), Sanofi-Aventis (consulting), Roche (advisory board member), Takeda (advisory board member), ImmuneWorks (consulting), Shionogi (speaker honoraria) and GlaxoSmithKline (advisory board member). JB reports serving as an ILD expert for the current international IPF guidelines; serving as Chair or member of the steering committees for the Panorama, BUILD-3, Artemis-IPF, Artemis-PH and RISE-IIP clinical trials; receipt of grants and personal fees from Actelion and InterMune; and personal fees from Boehringer Ingelheim, Grünenthal, Gilead, Bayer, Roche and GlaxoSmithKline. TMM reports receipt of grants and personal fees from GlaxoSmithKline (advisory board member); grants from Novartis; grants and non-financial support from UCB; non-financial support from Takeda; personal fees from Boehringer Ingelheim, InterMune, Lanthio, Sanofi-Aventis, AstraZeneca, Roche, Bayer, Biogen Idec, Cipla, DOSA, ProMetic and Galapagos; and serving as an investigator in an ongoing Gilead phase 2b study. WT, SSt and CH are employees of Boehringer Ingelheim. RMdB has served as a steering committee member for Boehringer Ingelheim and InterMune, and as an advisory board member for GlaxoSmithKline and Actelion. Ethics approval The clinical protocol was approved by an independent ethics committee or institutional review board at each participating centre.